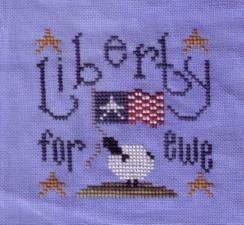 Crescent Colours - "Liberty for Ewe"
The chart is free and is stitched on Country Blue Hand-dyed Cashel linen with Crescent Colors: Weeping Willow, Plymouth Rock, Magnolia Blossom, Blackbird, Sassy Brass, Wavy Navy and Cupid. The price for the linen and full skeins of flosses is $19.50. Our little kit will contain the free chart, linen and necessary strands for $11.95 with no further discounts. 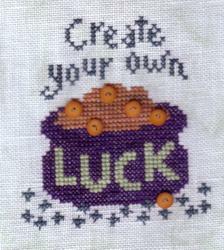 Cathy adds that this is a "quick stitch for St. Patrick's Day!!!"